Nolensville is a town in Williamson County, Tennessee. William Nolen, his wife, Sarah, and their five children were passing through the area in 1797 when their wagon wheel broke. 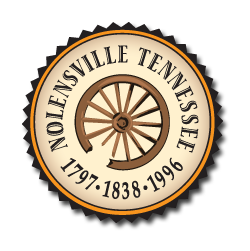 Forced to stop and survey his surroundings, Nolen noted the rich soil and abundance of natural resources, and decided to make Nolensville his home. William Nolen purchased a portion of a land grant to Jason Thompson on which Nolensville was later built. In the early 19th century, a large migration from Rockingham, North Carolina, brought the Adams, Allen, Barnes, Cyrus, Fields, Glenn, Irion, Johnson, Peay, Scales, Taylor, Vernon, Wisener, Williams, and other families to the area. Built along Mill Creek, the town was incorporated in 1839. Foraging and skirmishing took place here in the Civil War. Gen. John Wharton’s Confederate cavalry unit was stationed in town briefly and Gen. Joseph Wheeler’s command captured a Union supply train here on December 30, 1862. William A. Clark successfully defended a wagon train a year later in September 1863, earning the Medal of Honor for his actions. Nolensville was re-incorporated in 1996. August 1996 Nolensville voted by referendum to re-incorporate. In October 1996 the first election was held, electing the first three-member Nolensville Board of Mayor and Aldermen. The first Mayor of Nolensville was Charles F. Knapper, with the two Aldermen Thomas “Tommy” Dugger, III, and Parman Henry. Holding additional firsts was the hiring of the Town Attorney, Robert J. Notestine, III (as of August 2014 Counsel Notestine remains Nolensville’s attorney). On both sides of Nolensville Road from north of Oldham Drive to the south as far as York/Williams Road are many structures from the 19th century still in use as homes and/or stores. Within this area is a historic area which in the 19th century was the center of Nolensville. Of note is the Waller Funeral Home which has been in existence since 1876, the Nolensville Mill Company from 1890 to 1986 (today housing a store with Amish goods) and the Nolensville Co-Op Creamery from 1921-1957 which made butter known for its excellence throughout the area (now an antique store). The house north of the cemetery today is a veterinary clinic and the Home Place Bed & Breakfast, built in 1820, is still in use. Since being re-incorporated in 1996, Nolensville has had sustained growth. New home developments have sprung up around the city including Bent Creek, Winterset Woods, Burkitt Place, Silver Stream, Ballenger Farms, Sunset Farms, Summerlyn and more. As outlined in the recent article in The City Paper, Nolensville has had 290 residential building permits since the 2010 census and touts the lowest property tax rates in Williamson County. Other signs of growth are the new multimillion-dollar town hall, numerous business plazas and new restaurants. Additionally the Williamson County School Board recently purchased 95 acres (38 ha) on the south side of Nolensville for a new high, middle, and elementary schools which openeed in the fall of 2016. Franklin Environmental Services in proud to offer mold removal, radon testing & radon mitigation services in Nolensville TN. We perform mold remediation services, radon testing and radon mitigation, crawlspace moisture barriers and crawlspace encapsulation. We work with homeowners in Nolensville TN to ensure their homes are safe and secure from the dangers of mold and radon, and protected against intrusive moisture. Homeowners living in Nolensville face unique challenges when it comes to preventing mold from getting in their home. In Tennessee, there are over 100 types of mold that can attack your home both inside and out. It’s important keep an eye out for damp spots around your house, both inside and out. The best thing to do at the first sign of moisture is to take steps to dry out that area, and then call an expert. Franklin Environmental Services is certified by the Professional Mold Inspection Institute to handle all mold related issues you may face. Franklin Environmental Services offers professional radon mitigation services to the Nolensville area. Since Radon is impossible to detect, your best bet is to call a professional to ensure that you and your family are safe from this deadly gas. Franklin Environmental Services is certified by the National Radon Proficiency Program to perform radon testing and radon mitigation. Franklin Environmental Services is a trusted resource to Realtors looking for a partner. We help get homes mold and radon free and ready to show! We are fast, reliable and discrete. If you are a realtor in Nolensville TN, we would love to be a part of your winning team!